Growing Tomatoes: Tomatoes love warm weather and warm soil, so be sure to wait to plant out your seedlings until the weather settles in spring. Plant in a full sun spot and space at least 2’ apart. Most heirloom varieties are indeterminate growers, which means they keep growing until frost, and air circulation will help prevent foliage diseases from taking hold. Fertilize with a balanced organic fertilizer and water evenly, as most fruit cracking results from periods of dryness followed by periods of excess water. Mulch to conserve moisture. Look for large, leaf-colored tomato hornworms and remove. Pick your tomatoes often and enjoy! Rated #1 in taste tests! 'Blush' is a large oval cherry type tomato with shiny yellow fruit striped red, developing a warm orange blush when fully ripe. Very low acid, meaty, and super sweet. Large clusters and a heavy yield on a vigorous but contained plant. Blight resistant. The gold standard of tomato flavor, Brandywine Pink is a luscious heirloom that originated on Amish farms, with potato-leaved foliage on an indeterminate vine--one that keeps on growing and setting fruit all season. Large sized fruits have firm, dark pink skin and red flesh. A long season variety. A favorite at heirloom tomato taste testings, this sweet, rich, smokey tasting heirloom reportedly comes from the Cherokee tribe of native Americans. It has oblong fruits that are purple-brown in color, the shoulders often showing the most dark color. Multicolored inside with pink, purple and brown; green inside indicates it is not quite ripe. An indeterminate type that keeps on climbing, it needs good support. 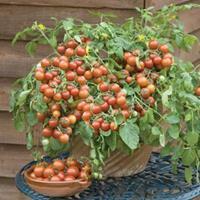 A sweet and tasty cascading cherry tomato for container culture and large hanging baskets. Full of bright red 1 1/2" fruit, it is amazingly prolific and long-bearing, producing all summer on a vigorous plant. Easy and rewarding. Almost lost to cultivation, this heirloom has been reselected for vigor and disease resistance. 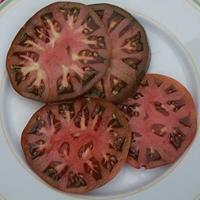 The earliest maturing cultivar to carry the famous 'crimson gene' with notably high lycopene content. Strong performance in cool conditions allows for early season harvests. A delicious, medium-sized slicer with 5-7 oz fruits that are bountiful, ripen nicely on the vine, and hold better than most heirlooms. A classic bi-colored variety from Ohio tomato collector Ben Quisenberry. And as Ben said, this is truly a gourmet delight. Wonderful 1 pound fruits. We believe that this is the finest yellow and red bicolored tomato available. A repeat winner of many taste tests. Indeterminate grower. A fabulous, rainbow mix of slicing tomatoes. You will be rewarded with an endless summer supply of slicing tomatoes and still have bushels of tomatoes for canning and preserving. A balanced formula mixture of Ananas Noire, Amish Paste, Brandywine, Cherokee Purple, Gold Medal, and Rossa Sicilian. All varieties are indeterminate and begin ripening around 80 days. According to seed farmer Aaron Whaley this is real contender for the best heirloom beefsteak. Potato leaf plants are loaded with 10-16 ounce, dark pink fruits with few seeds. Grows well in various climates. If you have tried Brandywine and found it finicky, give reliable Pruden's a try. The classic paste tomato from Italy, also a perfect choice for drying. Meaty, with few seeds and a distinctive sweet flavor that comes to life when cooked up into sauce.